First thing to do is to obtain the documentation of the card from the manufacturer (NXP in this case) and the Prox’N’Roll developer’s reference manual. 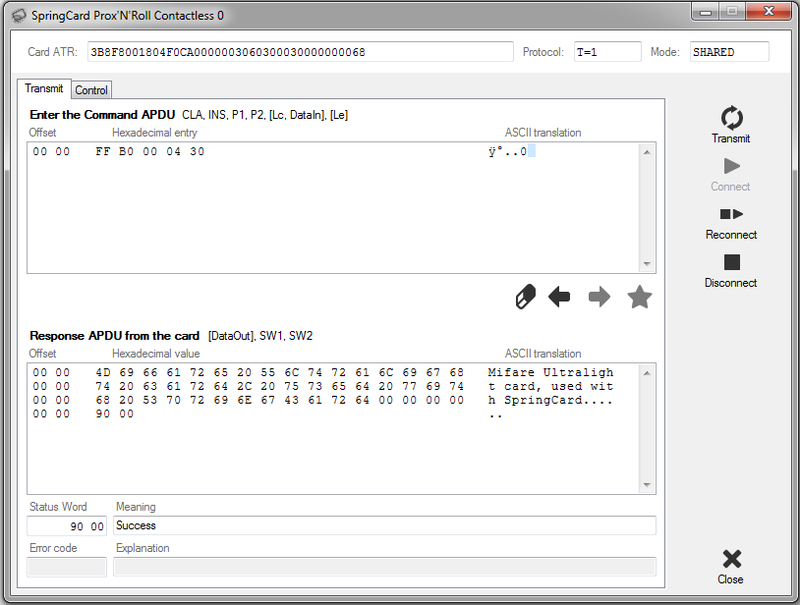 From the card’s functional specifications, we can see that the memory is structured in 16 pages of 4 bytes. The four first pages (0-3) contain special bytes: so, we’ll only cover pages 4 to 16. The goal is to read and write the card memory. In the developer’s reference manual, the READ BINARY instruction is described in §2.2.4 at the time of this writing. 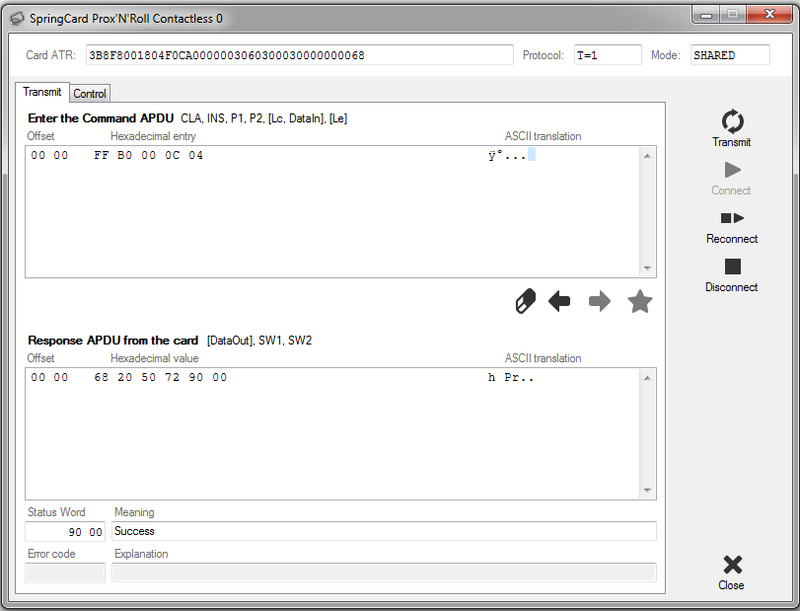 The specifics to read Mifare Ultralight cards are detailed in §4.3.3.a (at the time of this writing). Le must a multiple of 4. We want to read the whole memory, starting from page 4: this means we want to read 12 pages of 4 bytes, so 48 bytes (ie: 30 in hexadecimal). To send this APDU, please use our PC/SC Diagnostic tool, available on our main site (QuickStart for PC/SC). Put the card on the reader: its ATR prints. To understand what this means, you can check §4.1.2 (at the time of this writing) in the developer’s reference manual. 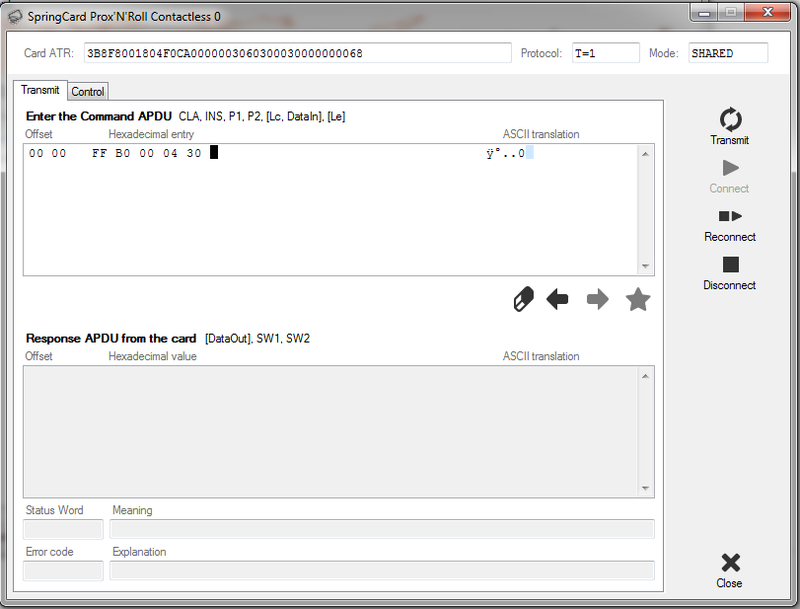 Clic on Transmit, or press “Enter”: the APDU is sent to the card and its response is printed in the bottom. 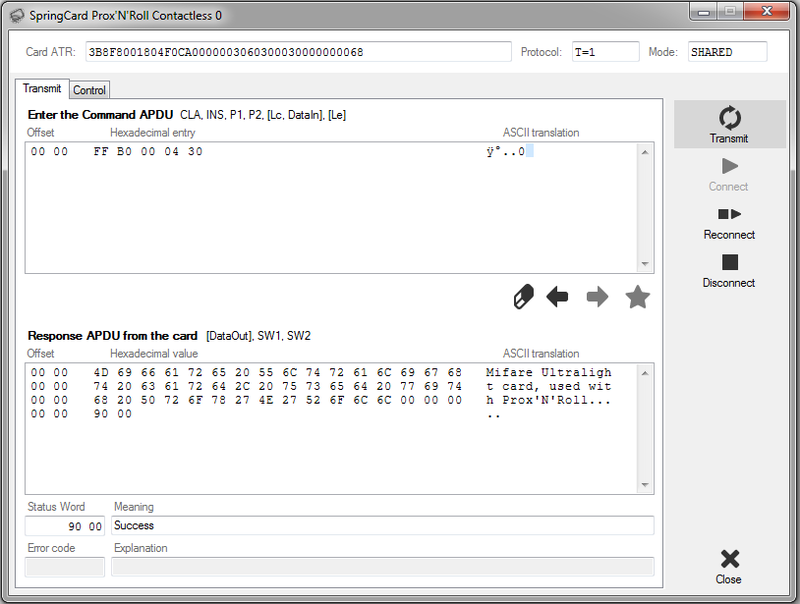 The card has obviously been previously written and the ASCII translation is provided: “Mifare Ultralight card, used with Prox’N’Roll”. Please note that the card’s reponse ends with “90 00”, which means success. In the developer’s reference manual, the UPDATE BINARY instruction is described in §2.2.5 at the time of this writing. 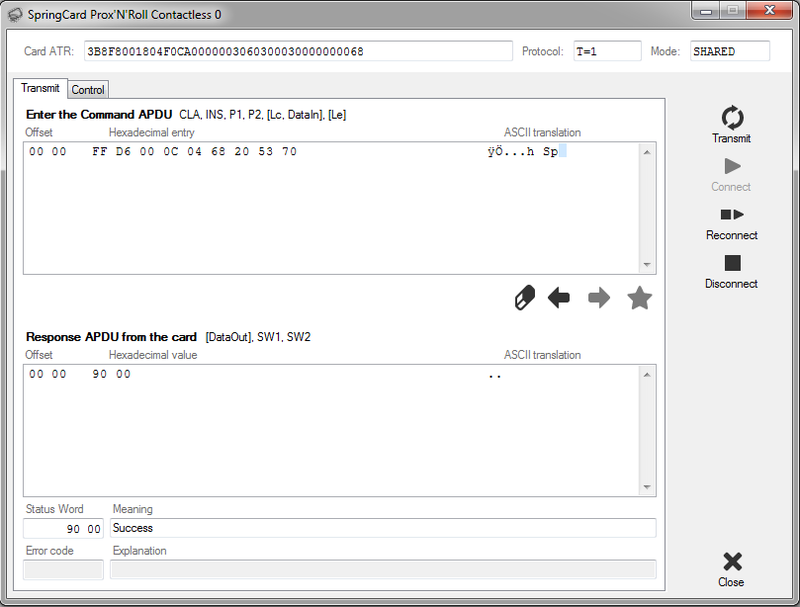 The specifics to write Mifare Ultralight cards are detailed in §4.3.3.b (at the time of this writing). We want to replace “Prox’N’Roll” by “SpringCard” in the card memory, so we first have to determine which pages must be updated. Remember that Le must be 4 : this means that we can write exactely 4 bytes at a time (one page), no more, no less. To determine the content of each page, just use the READ BINARY APDU. So, we’ll need to change 4 pages : pages 12, 13, 14 and 15. Operation is successful if the card answers 90 00. 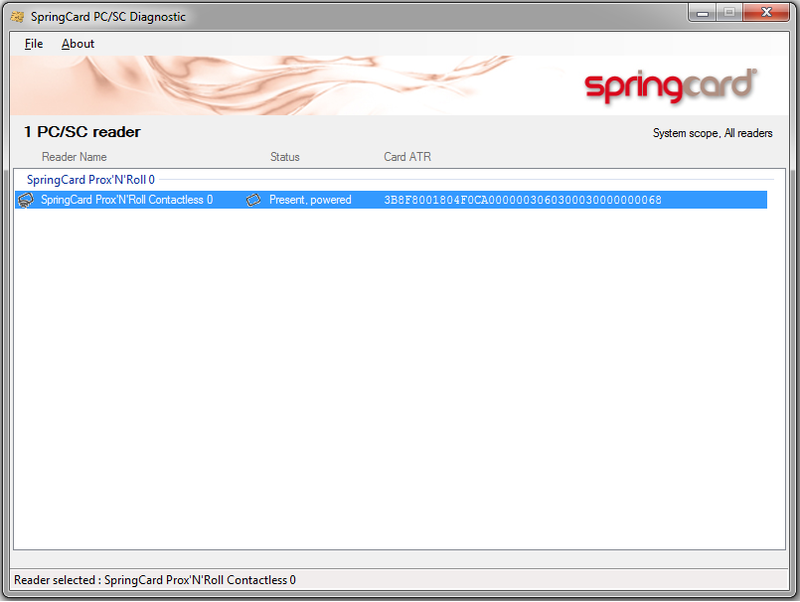 We can see that “Prox’N’Roll” has been replaced by “SpringCard” in the card memory.